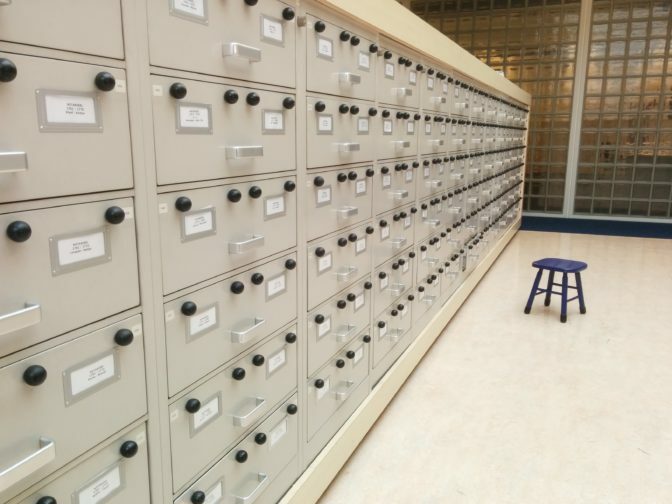 A kaartenbak is a card catalog. Creating card catalogs was the popular way to index genealogical records before the computer age. Not all kaartenbakken have been made available online, so a quick survey of the available catalogs in a reading room is a good first step in a research plan. Using the card catalog for database entry. This creates a digital version of the catalog that is fully searchable. There’s a risk that copying from the card catalog introduces new copy errors. Entering the data into the database from the originals. This is the preferred way since it has the least chance of copy errors, but also the most time consuming, especially if the card catalog is easier to read than the originals. Scanning the card catalog. This is often the cheapest way, but not the most user-friendly since the text won’t be searchable. When we’re using an index or database online, we can’t always tell if it was created from the original or from an earlier paper index. If we’re lucky, the website will explain the origins of the index. We should also consult the original since that will show any copy errors and the original may have more information.